Being a Lockit at its core, the ACN-CL carries the DNA of its predecessors and inherits all the unique and appreciated features, combined with the unprecedented ease of use that has been first introduced with the NanoLockit. Just like the NanoLockit, jamming units to time of day with the internal Real Time Clock is a one button experience, but with the additional perk of a crisp OLED display. 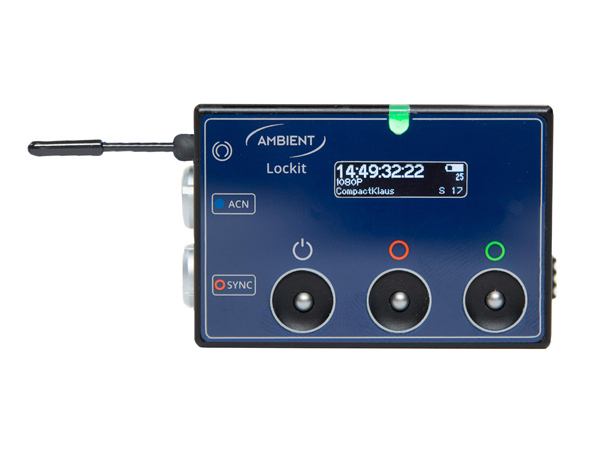 Lockit can also operate as master by automatically jamming units that are added or restarted during the day. The OLED also brings the useful timecode compare tool introduced with firmware 6.0 so it is easy to determine if other equipment is still in sync – with an accuracy of 1/100 of a frame.